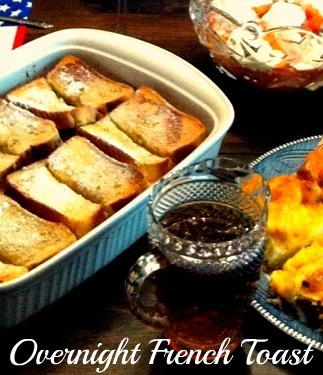 Overnight French Toast is a delicious rich breakfast or brunch dish that is prepared the night before and placed in the refrigerator and then baked the next morning. I have been searching for the perfect recipe for some time. I could not find one that wasn't like a bread pudding in texture. This recipe is just as perfect as I wanted it to be. Texture wise, it is creamy delicate on the inside and tender on the outside-- being able to cut through with ease similar to the perfect French Toast. Taste wise, it is absolutely scrumptious! Birthday breakfasts are another way to celebrate a person's special day. The first of July, my Grandsons, Luke turned 14 and Gabriel turned 11, wanted to celebrate their birthday breakfast at my house with their other cousins who were in town for the week. I asked Luke what he would like me to make. He said "just surprise me Grandma"! 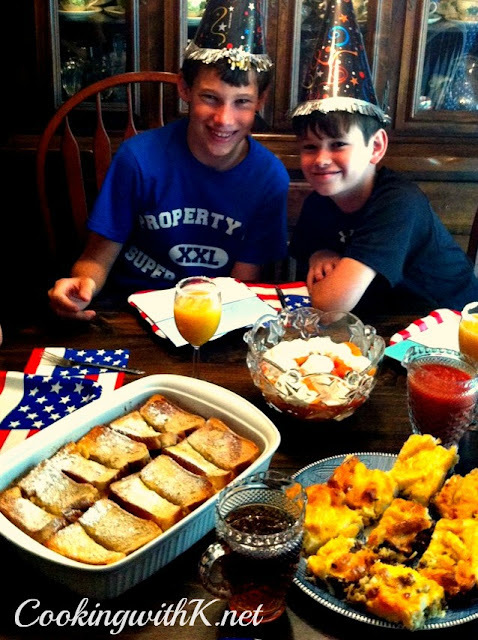 I made him this Overnight French Toast dish with Honey Syrup, and a favorite in our family for years, Breakfast Egg Casserole that I will be posting later. In a 9 x 13 oblong dish, melt butter in the oven or microwave. After butter is melted, mix brown sugar until blended. Smooth out the brown sugar in the bottom of the dish. Lay 6 slices of Texas Toast on top of the brown sugar mixture; set aside. In a 2 cup measuring cup, add 3/4 cup of milk and beat 3 eggs, vanilla and 1/4 cup sugar until eggs are incorporated. Pour over the Texas Toast layer. Place 6 slices of Texas Toast on top; set aside. In the same 2 cup measuring cup, add 3/4 cup milk and beat 3 eggs, cinnamon, and 1/4 cup of sugar until eggs are incorporated. Pour over layer of Texas Toast. Cover with foil and place in the refrigerator overnight. The next morning Preheat oven 350 degrees F. Uncover French Toast mixture and bake for 45 minutes or until knife inserted comes out clean. Cut each slice of Texas Texas Toast in half and serve with sifted powdered sugar and honey syrup (recipe below). Cook's Note: We prefer the crust on the Texas Toast, but you can remove it. We like it on, but it totally up to you! On the brown sugar, you can adjust to your taste. Some in our family like it with 1/2 cup brown sugar and some, like me, like it with 3/4 cup brown sugar. In a small saucepan on medium heat, heat honey and syrup together until hot. Remove from heat and add butter. Stir well and server warm over pancakes, waffles, or french toast. That cute grandsons you have! The French toast sounds wonderful. You share the best recipes! Oh Grandma - what a sweet blessing your boys wanted to celebrate at your house! Sounds like a fabulous recipe...printing now! I have already printed this recipe and will be using it next week end for a large family gathering, it will be perfect! Hope you are having a great week and thank you so much for sharing with Full Plate Thursday. Thank you Helen ~ I so enjoy Full Plate Thursday...hope you have a great weekend! French toast is a favorite here, so yours looks really delicious. What a great start to a birthday! what is blackburn syrup? is there a substitute if I can't find it? Thank you.